And it’s out on iPhone and Android! Not that I own either of them, and not that I can read Japanese – but still! It’s a free download, you probably have to pay for some in-game things that you want. Luckily I’ll be going to Japan sometime soon, and I will get an iPhone so I can play this game, hehe. This will be fun. The game seems focused on running your own cafe or restaurant or whatever, and you’ll meet up with these idols (or should I say you lure them in?) from this boy band. There’s two boy bands; X.I.P. and 3 Majesty. Dumb names, but whatever. Then you go on dates with your favourite castmember. 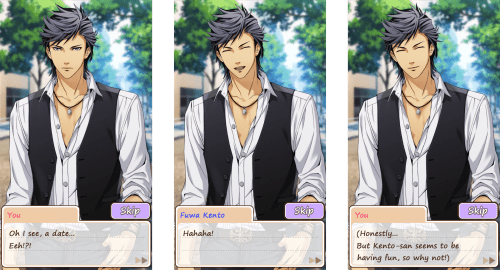 The portraits are Live 2D just like the previous Premium Tokimeki Memorial Girl’s Side, which is exciting. I love seeing them move. Some people have already provided a few translations, but I doubt much more will be translated. So basically it’s learn Japanese, or don’t play. Luckily the entire game seems to be voice acted, so you can at least listen to them. I’ll probably be aiming for Tsuji Kaito and Fuwa Kento. So apparently there was this extra scene at the end of the very last OVA of The Prince of Tennis, and I didn’t know about it! All these years, and it was right under my nose. Sigh. This is what I get for skipping credits. They show Kaidoh and Momo in their third year, running the tennis club together as captain and vice captain. Kaidoh sports a fancy red bandana, though in my opinion he should have gone blue since that is his favourite colour. Actually, red is Momo’s favourite colour. Hm. Food for thought. Momo seems to have ditched his traditional yellow shirt for a black one. I’m not quite sure why he started wearing the trackpants again, since he looked good in shorts. It’s nice to see it in action though! So I just found out about this game today, and I’m having fun just setting Kaidoh and Momo up against each other in a tennis match. It’s pretty cute. I have no clue what I’m doing though. Hi there, I'm Celianna! I'm a graphic designer and artist. I make art for RPG Maker, as well as draw fanart and write fanfiction in my free time. I'll be posting about anything art or fandom related here.